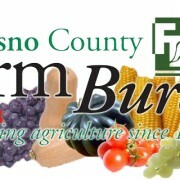 FRESNO – The Fresno County Farm Bureau, established in 1917, held its annual Celebrating Friends of Agriculture at the Blue Moon Yosemite Station at the Fresno Fairgrounds Thursday evening. Among the invited guests were local agricultural leaders, including farmers and ranchers, as well as media. As is the tradition, awards were presented to media for their efforts in spreading the word about the industry. “We need all the faces out there to make agriculture work, that is what Farm Bureau is all about,” said Mark Sorensen, first vice president of the Fresno County Farm Bureau.